May | 2012 | Food E.
We’ve had the wonkiest weather ever in New York for the past few months, and the warmer temperatures have definitely affected my appetite. Not affected as in like, I lost it (that is reserved only for the most traumatic of traumas, I assure you) but in the way that I’ve been craving summer foods before I’m supposed to. Case in point: the lobster roll. In the interest of full disclosure, I used to work very close to a little spot that sold lobster rolls for $10 and I used to go a sickening amount. Thank God I don’t work at that job anymore… my cholesterol can’t take it anymore. Anyway, I was craving a lobster roll like I can’t even tell you, so I Googled “Best lobster rolls in NYC” and came up with the list of usuals: Luke’s Lobster, Red Hook Lobster, and one I’d never heard of: Ed’s Lobster Bar. I took a look at their menu… and I was sold. If you don’t like lobster or seafood in general, please don’t go to this place. You’ll simply clog it up for those of us who live for the stuff. Ed’s Lobster Bar Annex, 25 Clinton Street (btwn Stanton St and E Houston St), New York, NY 10002. Ed McFarland, owner of Ed’s Lobster Bar, is a Staten Island Native who grew up in pizza parlors and later graduated from the French Culinary Institute. He worked all over, in esteemed kitchens throughout the city, until he opened up his own place. Ed’s Lobster Bar (the original) is located on Lafayette between Broome and Spring and offers a more refined menu of full lobster entrees. The Annex, where I dined last weekend, has more of a low-key, relaxed maritime vibe with menu offerings such as lobster meatball sliders, mini lobster thermidor pizzas, and shrimp tacos. During the summer months they have an outdoor patio where you can sit and sip a cold white wine with your seafood. Note: the annex only serves wine and beer. Verdict: Oooooh lobster lobster love of my life. 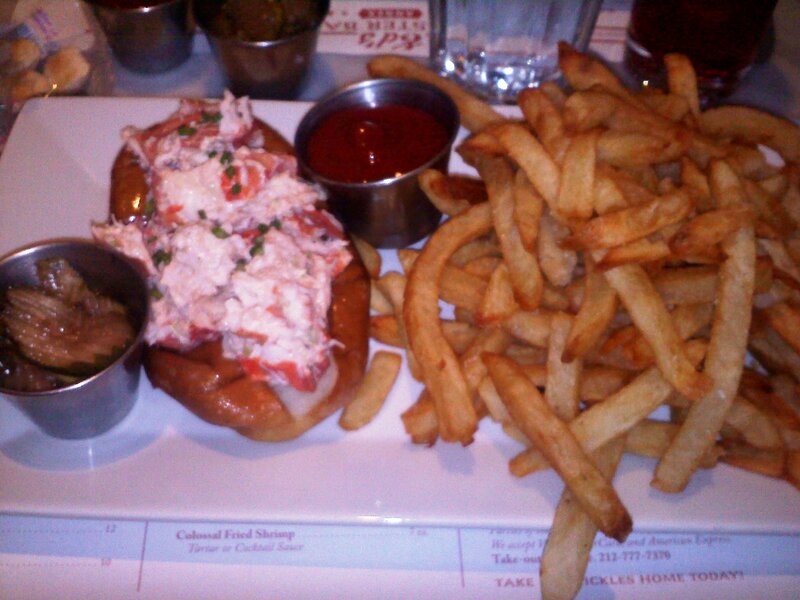 This had to be one of the best, if not THE best lobster roll I have ever had. Three words: butter soaked bun. That’s right. Just in case you were thinking, “Oh no, where’s the butter to dip all the giant chunks of lobster in my lobster roll?” Ed’s has you covered. The bun is literally brushed and semi-soaked in butter. I had to stop myself from licking the plate. I could’ve even done without the fries… maybe substituted it with more lobster? And as a side note, they make their pickles on premises and they are spicy and sweet and I ate so many I burnt my tongue. …I’m not joking. In addition to the amazing food, the staff was super laid back, informed, and efficient. I’ll be back, Ed. I’ll be back. 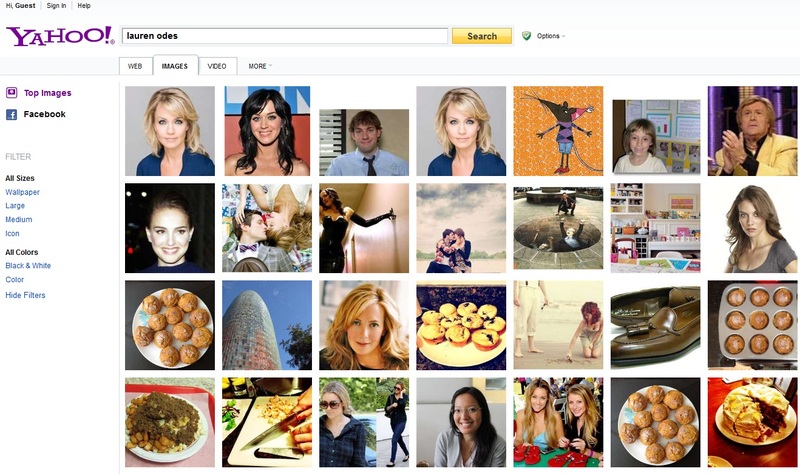 If you didn’t recognize them, SEVEN of those pictures are mine. So if you’ve stumbled upon this blog because you were creeping on this lovely lady, then welcome! I, too, am a lovely lady. But would probably never be fired from anything for being anywhere near too provocative. I make muffins to make up for my chesticular shortcomings. Enjoy! Ladies and gentlemen, if I could have your attention please. This is an opinion piece. It might offend some of you and you might take it as my bitterness, or my negativity, or my cynicism. But I think it’s my job as a food writer to give you honesty, and this piece is just one little bit of one person’s opinion. I’m giving you that warning in case you don’t want to read on. I’ll have a nice, safe, happy restaurant post later in the week to get you settled back into the rosy Food E. you have come to know and love. Stop laughing, mom. 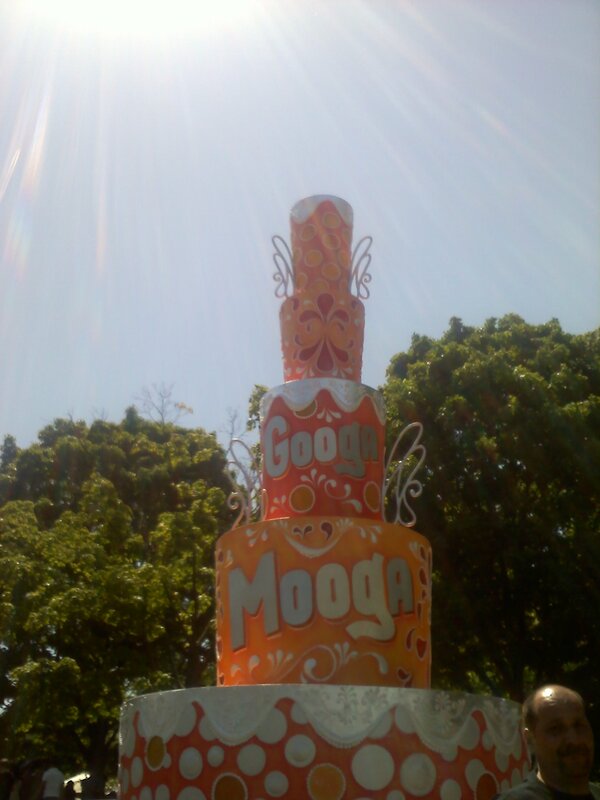 I found out I’d be attending The Great Googa Mooga Festival on a two day press pass. I looked over the schedule and decided that since the food vendors were the same both days, and I already had plans to eat lobster rolls on Saturday night, I’d skip out on Saturday and attend the festival on Sunday only. I’m glad I did. I read endless Facebook and Twitter posts about how unbelievably crowded it was on Saturday, how long the lines were, and how most vendors ran out of food by 3pm (Eater has a great roundup of angry Tweets here). This boggles my mind, since although admission was free, you had to register for tickets in advance and the event sold out. If the event staff knew how many people would be attending, how is it possible that they didn’t have enough food? The world may never know. By the time I checked in and got my wristband, I was starving and thirsty. I entered the festival expecting super long lines, but to my surprise, there were none. That’s right. No. Lines. I was right in front of a beer tent so obviously my first purchase was alcoholic. I paid $7 for a Blue Moon – a bit steep, even for New York prices, but compared to the $12 beers at baseball games in the city it wasn’t that heart stopping. Besides, I’m not one of those people who likes to get hammered in the middle of the day just for the sake of getting hammered; I wanted a cold beer to add to the enjoyment of the day, not eight beers so I could throw up in front of hoards of people like one girl did (I’m not kidding… I read about it. Thank God I didn’t have to see it). In deciding where to eat, I figured I needed a strategy. I ran through the list of food vendors on the Googa Mooga map and immediately ruled out a few – I didn’t want to eat anywhere I’d already been (via food cart, festival vendor, or actual brick and mortar restaurant); I didn’t want to eat somewhere just because the place or the dish was trendy (this ruled out M. Wells’ horse bologna grilled cheese, and Do or Dine’s foie gras donuts… that’s right… I turned down a donut); and I didn’t want to eat anything that seemed boring (this eliminated dishes like pulled pork sandwiches and fried cheesecake balls). My first food purchase fit all the criteria: a wild boar sloppy joe from Georgia’s East Side BBQ. I’ve definitely never had wild boar in any form, and I had never even heard of Georgia’s. If that sandwich is any indication of what the food at their restaurant is like, I’ll be a regular in two months flat. There wasn’t a single person in line and the meat was piping hot and only $7 for a giant meal (I should note that most dishes at the festival fell in the $7 – $10 range). The sandwich had the spicy, sweet flavor you associate with sloppy joes but with an added crunch from chopped onions and a hearty, slightly gamey flavor from the wild boar (I should also note that this sandwich is not on their regular menu, and that won me over, too: a dish prepared specially for the event). 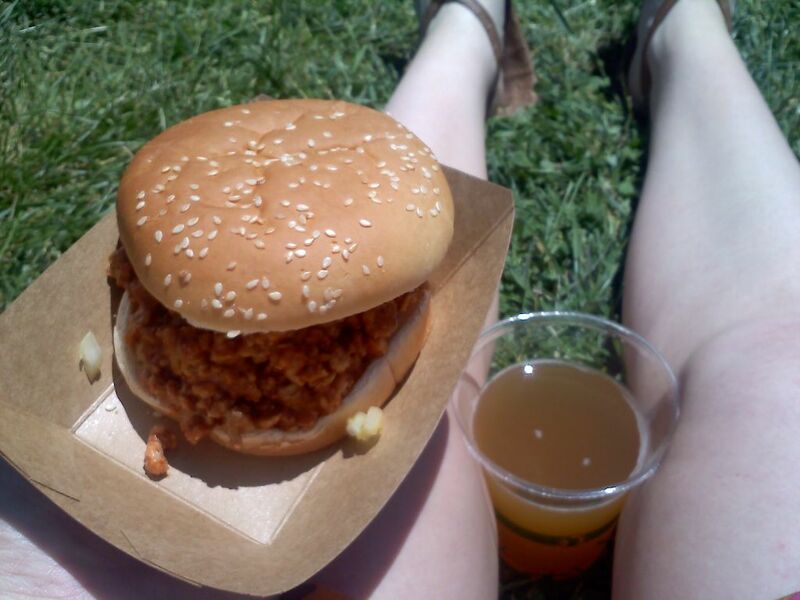 As I sat in a grassy field watching the Air Guitar Champion pretend to be a heavy metal superstar on the stage in front of me, soaking up the sun, sipping my cold beer, noshing on a saucy sandwich… I had to admit that Googa Mooga had already won me over. I ate the entire sandwich, loose bits of fallen meat included (don’t worry, I wore a patterned outfit so no one would see the food stains), and ventured on to another area of the park for my next bite. I stumbled across the Coffee Experience sponsored by Lexus (which meant that in true Brooklyn, hippie festival style you could… sit in a luxury car?) 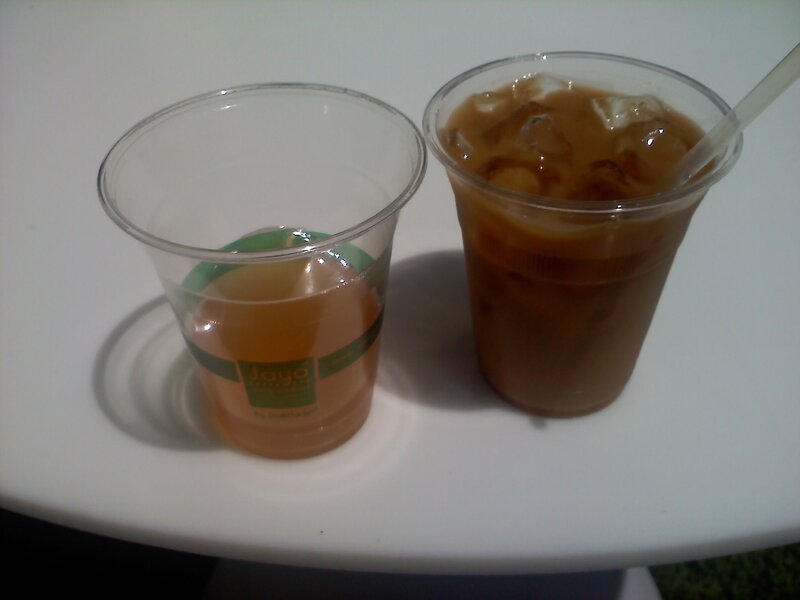 and got myself a freshly brewed iced coffee, brought to festival goers from Third Rail coffee in New York. I took a lap around the food vendors to check out which dishes were being offered, and shortly thereafter got in line at Red Rooster Harlem. I knew of the restaurant as famous chef Marcus Samuelsson’s spot featuring soul food with an Ethiopian twist. The line was comparatively long (I waited for around 10 minutes, a good indication of how sparse the crowd was around 1pm), no doubt owing to the chef’s celebrity status. 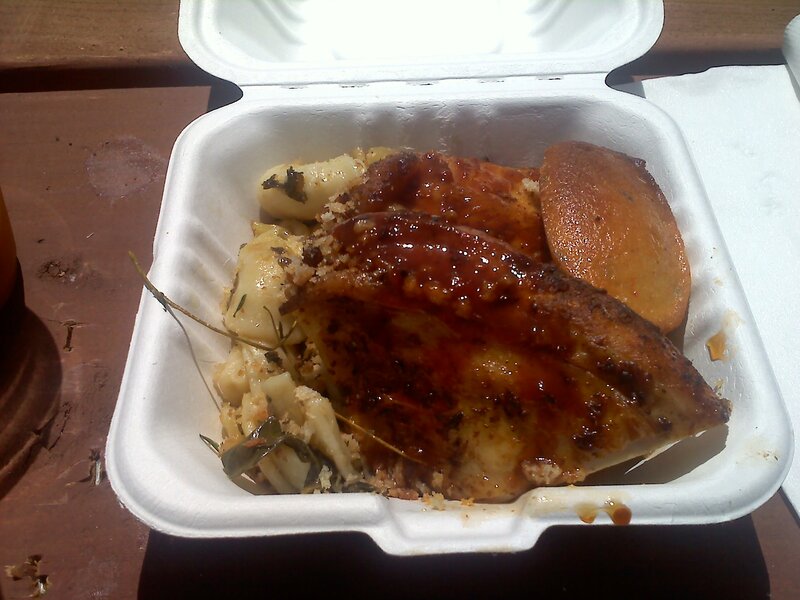 Each booth at the festival had only one or two offerings, and Red Rooster Harlem’s signature dish was one of the most notable and generous: Berbere chicken with macaroni and greens and cornbread. You could get the “small” plate (2 pieces of chicken, ½ cup mac and greens, one piece of cornbread) for $7, or the large plate with bigger helpings of each for $11. The small was perfect for me because I’m not a huge eater (again… stop laughing, mom) but the food was so incredibly delicious, I almost forced myself to finish it. The chicken was juicy with a spicy, crispy skin coated in Berbere: an Ethiopian spice blend. The mac and greens were cheesy, a bit crunchy, and perfectly salted. The corn bread? A little Madeleine-shaped corn cake with Indian spices baked in. The dish was the standout of the festival, and it’s on the menu at the restaurant up in Harlem. At this point, I knew I was done with main dishes and I wanted something sweet. I saw a mention on Twitter of maple cotton candy, and the Adirondack girl in me begged for it. 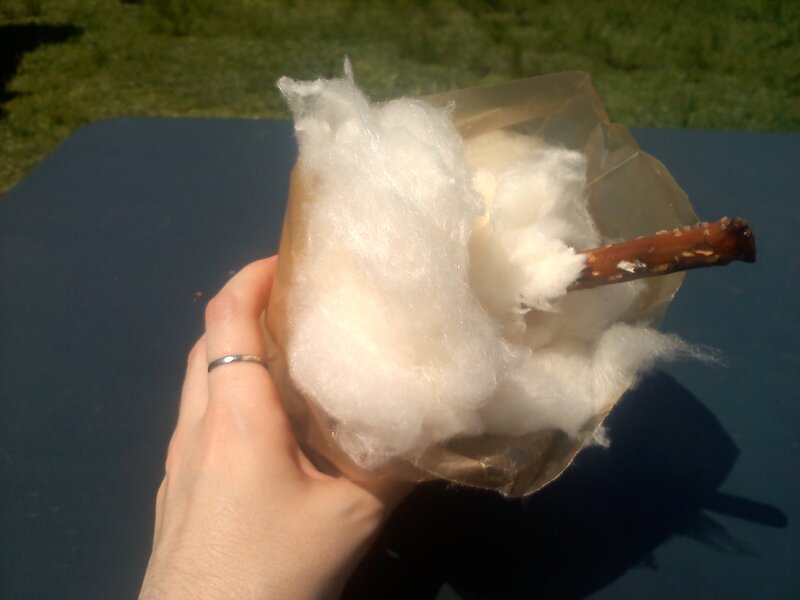 I found the cotton candy stand and forked over 5 bucks for the sweet treat… that’s right, $5. It was by far the most outrageously priced thing I paid for, but I have to admit, I’m glad I got it. It was delicious. And anyone who can make cotton candy feel gourmet is alright in my book. The dish was prepared by Liddabit Sweets. I had one more dish in me, and from the looks of the crowd, it was a good time to get going. As the clock neared 2:30PM the crowds were noticeably larger and the lines were visibly longer. My jaw dropped when I saw the nearly 100 people in line for Luke’s Lobster Rolls (side note, people: Luke’s Lobster Truck is everywhere and they even have a stand alone restaurant in Manhattan… you could’ve walked there and back in the time you waited in line). 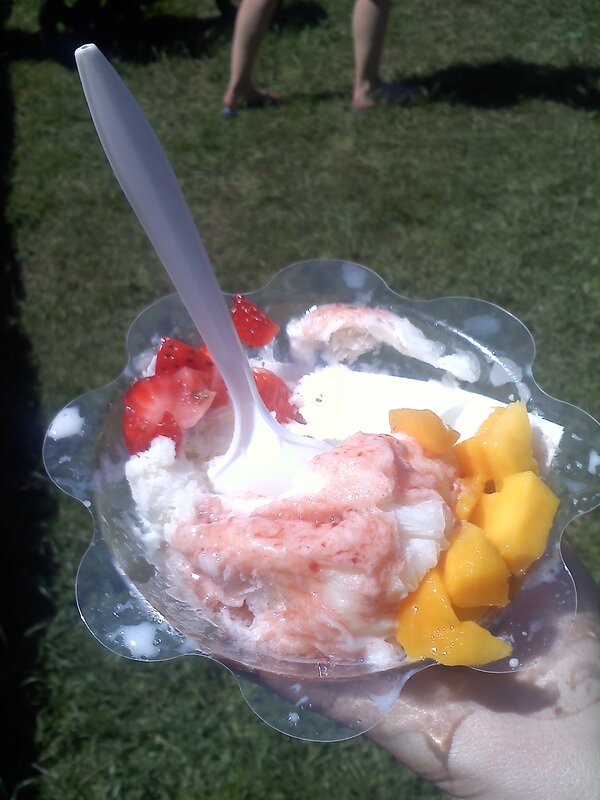 I kept seeing people with frosty ice cream covered in fruit and I was practically dying for it. Wooly’s ice was right next to Big Gay Ice Cream – I had to make a decision. I’d always wanted to try Big Gay Ice Cream but figured, they attend a lot of festivals, they have a truck, and a shop; there would be plenty of future opportunities for me to eat there. Wooly’s it was. I’m glad I picked Wooly’s because after 5 minutes of waiting in line, Big Gay Ice Cream announced they were out of… ice cream. That’s right, at 2:30PM, with five hours left to go in the festival, they were out of ice cream. All this on a day that wasn’t nearly as crowded as the day before. I got my cup of ice (which I realized was literally a cup of shaved ice with strawberry syrup and chunks of fruit) and happily exited the park as hoards of people were entering. I was lightly sunburned, pleasantly full, and ready for a nap. Overall, the festival was a pleasant way to spend a Sunday afternoon, but I have to say: if you wanted to really soak up the experience (rubbing elbows with celebrity chefs, dancing at the Big Gay Ice Cream disco party, sitting even remotely close to the big music stage, and catching even a glimpse of Anthony Bourdain) you had to fork over $250 for the VIP Extra Mooga package. I understand that to a lot of people $250 is not a huge expense and for all the extras included it might be worth it. But to me, it added an exclusive element to a festival that felt otherwise very communal. Food lovers filled the park talking about the multitude of offerings, speaking intelligibly about chefs and ingredients, and yet there was a velvet rope cordoning off those chefs and keeping the full experience at arm’s length. We were forced to watch from the other side as the “big names” hung out in some kind of elitist gang while we waited in hour-long lines for just a taste of what those big names’ culinary genius had to offer. I wanted to eat at Red Rooster Harlem but I also hoped that Marcus Samuelsson might be slinging chicken for an hour or so with his staff. I was happy to see a sausage making demonstration at the Just Food tent but how cool and grass roots would it have been to have Anthony Bourdain cranking the meat grinder handle? The well-known chefs were the ones who conceived the event, and yet their company was only available to the big spenders. It was a festival in two tiers: the everyman and the elitist. And to me, that’s just not what food is about. I’ll probably attend Googa Mooga again next year, but I’ll show up at 11AM and I’ll bring ripe tomatoes to chuck across that velvet rope. 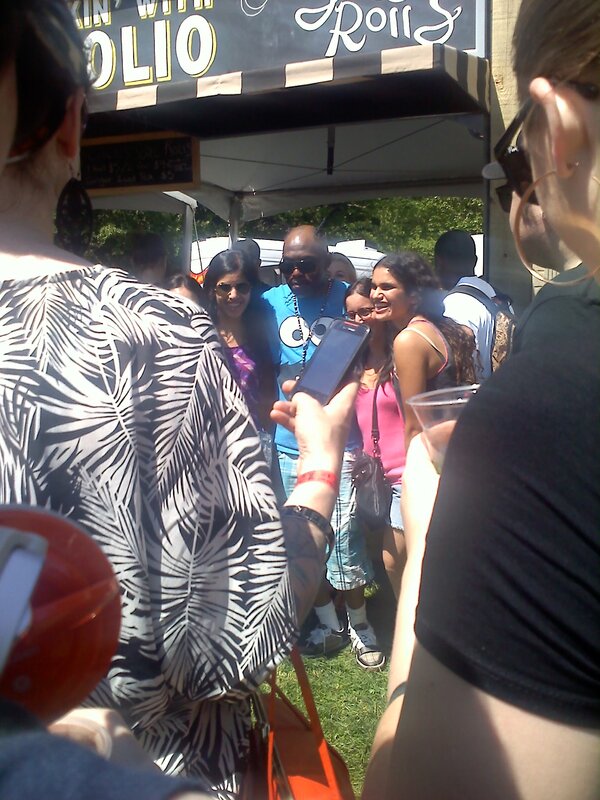 Oh… and Coolio was there, promoting Cookin’ with Coolio and Soul Rolls. I don’t actually know what either of those are. I know what you’re thinking… the what? No, it’s not the name of my future-first-born child, it’s a monster food and music festival happening in Brooklyn this weekend! I’ll be live Tweeting the entire event @LaurenFoodE and will bring you full coverage at Yumm.com on Monday! I just wanted to put up a quick post in honor of my beautiful mommy, Joanne Miller. Happy Mother’s Day to the woman who instilled a deep and spiritual love of baked goods in me; the woman who helped me cultivate my sarcasm and snark; the woman who is my biggest fan. I love you, ma! PS: I was going to put a nice picture of our family up here but then I thought you’d get mad at me… so instead here are some pictures of your children. I have an ongoing discussion with my friend Nicole on what constitutes a meal. I vehemently defend anything I’ve ever posted on this blog, and she denies most of it. Nicole: Macaroni and cheese is NOT a meal. Nicole: Pancakes are cake, NOT a meal. Nicole: A muffin is NOT breakfast, it’s cake. Now, anyone who knows me knows that I can pretty much call anything into a meal. For one solid week last year I ate nothing but chocolate cake and red wine for dinner. If it’s 6PM, and I eat a slice of cake and drink a glass of wine, and then I’m full, and then I go to bed… how come that’s not dinner? I’m not feeding it to my growing children, or even my hungry boyfriend. Nicole would probably argue that there is literally zero nutritional value in chocolate cake and red wine (except for all those antioxidants! what whaaaaat). And that’s her argument against macaroni and cheese, and pancakes, too. Zero nutritional value. Does a “meal” have to have a certain amount of nutritional value to actually be worthy of the name? I dare you to find a single, city-living lady who has never called cheese and crackers dinner. What do you think, guys? What’s a meal? Are pancakes a meal if you add bacon? 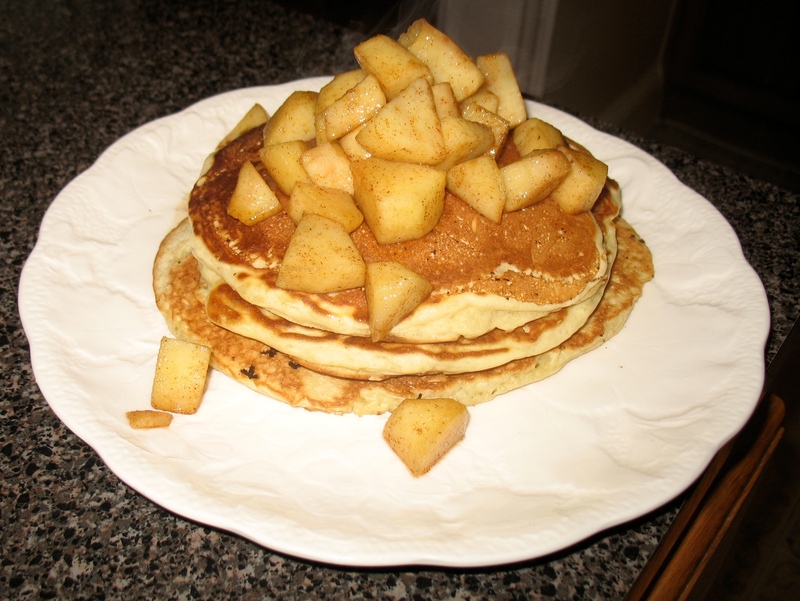 Or top them with apples? Why is spaghetti with sauce and garlic bread considered dinner, but not pancakes? Why is a bowl of Lucky Charms breakfast, but not slice of pound cake (FYI: they both have TONS of sugar). Is greasy Chinese takeout a meal even though it has endless amounts of MSG, fat, and oil? How about a pepperoni pizza? I rarely ask outright for your comments, but this time I want them! Go ahead. Comment away. That’s right… I’m lookin’ at you. To me, and George Costanza*, a muffin is just a piece of cake that’s acceptable to eat for breakfast. So I bake a lot of muffins. A. Lot. These are moist, delicious, and they have so much lemon in them that they’re actually a bit tart. 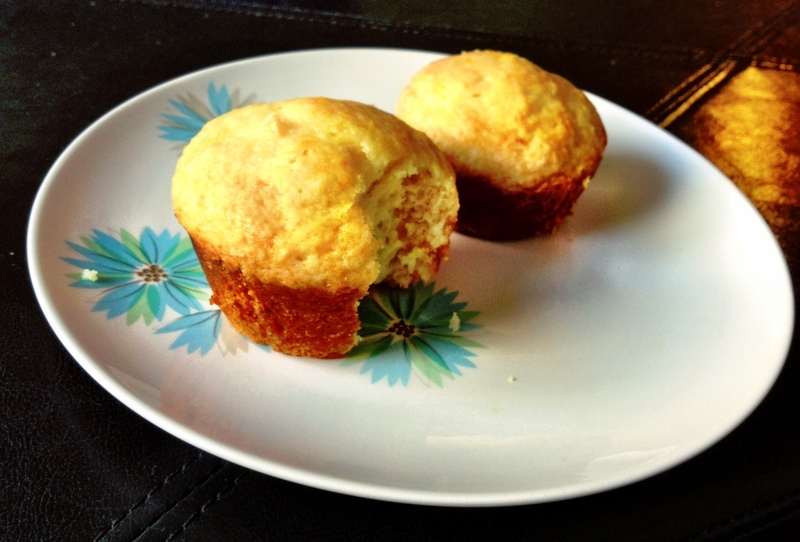 Sunday was so sunny and spring-like that lemon muffins seemed like a no brainer. In a medium sized bowl, combine first 6 ingredients. In a separate bowl, blend egg, yogurt, melted butter, and lemon juice together with an electric mixer. Fold wet ingredients into dry ingredients, just until moistened. Fill lined or greased baking cups 2/3 full. Bake for 20 – 22 minutes, or until tops of muffins are lightly browned. Let muffins cool for 5 minutes. In the meantime, in a small saucepan over low heat, combine lemon juice, sugar, and lemon zest until combined. Poke 6 – 8 holes into each muffin (still in the pan) and spoon 1/2 Tbsp of glaze over each muffin. Let cool for 30 minutes and then remove from the pan.